Centric Place Hotel is conveniently located in Ratchadapisek Area, just 15-minutes from Suvarnabhumi Airport via the nearby Airport Rail Link. It offers affordable accommodation with key card access to ensure safety. Spacious and comfortable, the guestrooms are furnished with dark earthy tones to create an inviting atmosphere. Each is equipped with a cable TV, a safety deposit box and minibar. A hairdryer is included in an en suite bathroom. Guests can make use of the internet corner and business centre. Centric Place Hotel also provides daily newspapers, a 24-hour front desk and laundry services. Local specialities and a daily breakfast buffet are served at the restaurant. Drinks can be enjoyed at the hotel's cocktail bar. 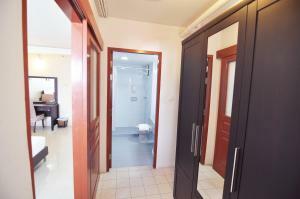 The property is a 5-minute walk to Rama 9 MRT Subway Station, Fortune Town and Central Rama 9 Department Store. It is a 30-minute drive to Suvarnabhumi Airport. Air-conditioned room features a private balcony, a cable TV and a minibar. A tea/coffee maker and a safety deposit box are provided. A hairdryer is included in an en suite bathroom. Rate: THB 1035.00 ... THB 1450.00; select dates below to get current rates. 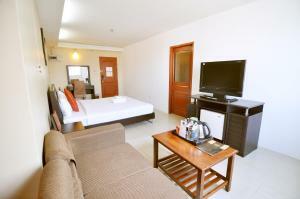 Larger air-conditioned room features a private balcony, a cable TV and a minibar. A tea/coffee maker and a safety deposit box are provided. A hairdryer is included in an en suite bathroom.